After attending the mid-day Eucharist in Lichfield Cathedral yesterday [24 October 2015], I went to the special exhibition in the Chapter House, where a number of items from the British Museum are on display. 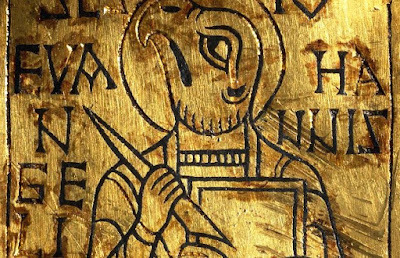 The exhibition in Lichfield Cathedral, “Books and Literacy in the Age of Saint Chad,” includes items from the British Museum such as the Brandon Plaque, which gives clues about how works may have been bound in Anglo-Saxon times. The Saint Chad Gospels is believed to be older than the Book of Kells, and it is likely that it was created in the eighth century to adorn the shrine of Saint Chad, who died in Lichfield in 672. Other items on loan to Lichfield Cathedral include an eighth century book decoration from Ireland, the Bowleaze Cove Jewel which originally decorated a pointer used to follow the words when reading, a ninth century ring showing a figure holding a book, the eighth century Blythburgh Writing Tablet from Suffolk, and a seventh or eighth century stylus from the Marne region in France. The Brandon Plaque shows a figure with an eagle head, representing Saint John the Evangelist. His identity is emphasised by the book and the quill pen which he is holding. This may have been one of a set of four such plaques, representing each of the four evangelists and used to embellish the cover of a Gospel book. A gold ring shows a winged figure with a halo who is said to be either an angel or one of the four evangelists holding a Gospel book. The Anglo-Saxon wearer of such an elaborate ring would surely have respected and admired books such as The Saint Chad Gospels. A tiny gold disc displaying a high standard of craftsmanship also depicts Saint John, this time with an eagle and the letters A and q, an abbreviation for Aquila (Eagle), and a book. A gilded bronze book mount from the eighth century comes the Phoenix Park in Dublin. Its decoration is similar to the style used to decorate Anglo-Saxon manuscripts. The Bowleaze Cove Jewel, found near Weymouth in Doret and dating from the ninth century is the head of a pointer that helped a reader to follow the words in book and to turn the pages. “Celts: Art and Identity” at the British Museum is the first major exhibition to examine the full history of Celtic art and identity, and is organised in partnership with National Museums Scotland. The cathedral exhibition illustrates how the decoration of books in Anglo-Saxon times and the way they were used reflected the great value placed on books and literacy. The Saint Chad Gospels are no longer in their original binding, however some of the exhibits give clues as to how Anglo-Saxon binding might have looked. These complementary exhibitions continue at Lichfield Cathedral and the British Museum until 31 January 2016.